Search results for "los angeles"
Quarters, a major European co-living company, plans to invest $300 million toward building new developments across the United States and becoming the nation’s largest co-living operator by 2022, according to an article in Curbed. Millennials are the primary target demographic for the co-living industry. Due to financial issues and their tendency to lead nomadic lifestyles, young adults are typically the most interested in shared housing spaces. By offering pre-furnished bedrooms, shared common spaces, and amenities such as 24/7 laundry access, cleaning services, Wi-Fi, and community events, co-living companies like Quarters want to provide Millennials with more affordable access to increasingly overpriced, metropolitan neighborhoods. Quarters’s $300 million expansion deal was made possible by a $1.1 billion fundraiser led by its parent company, Medici Living. 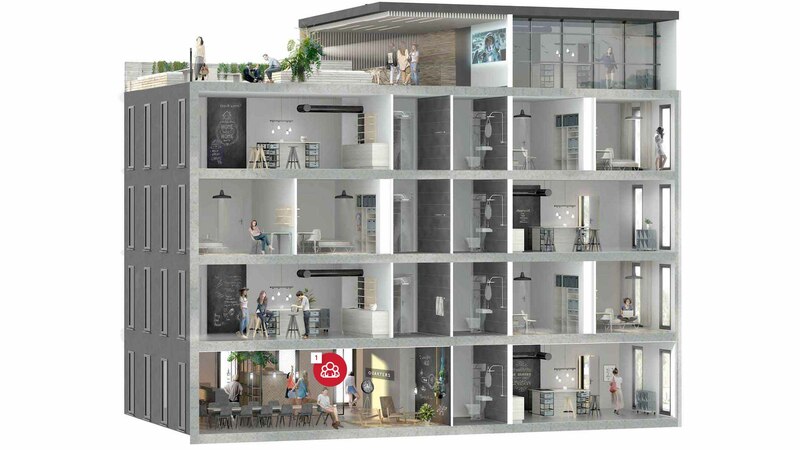 Medici’s goal is to buy and build up to 35 co-living facilities throughout Europe, and over 1,300 new residential units in the U.S. within the next three years, according to Curbed. The Berlin-based company already operates co-living spaces in New York City and Chicago, but it plans on expanding its footprint to cities like Boston, Denver, Los Angeles, Philadelphia, San Diego, and Seattle—all of which are teaming with millennials and startup activity. Residential projects at these sites could house between 100 and 300 people, while new spaces in New York could hold up to 500. Like Quarters, other co-living firms have upped their ambition, diverting their attention away from small group homes to focus on large-scale high-rises. WeWork, the massive, New York-based co-working company, recently unveiled "WeLive," its latest co-living project with its first apartment building located at 110 Wall Street in Manhattan. The Manhattan high-rise, whose private studios start at $3,050 a month, offers apartment dwellers flexible leasing, access to fitness classes, cleaning and laundry services, potluck dinners, and a digital social network, all conveniently accessed through a mobile app. According to Curbed, WeLive, if successful, plans to eventually house 600 people throughout the 20 floors of the Lower Manhattan high-rise, as well as build more developments in other major U.S. cities. While co-living is not a new or innovative concept, companies like Quarters and WeWork have transformed it into a business model to take advantage of the fluctuating economy and provide young adults with a service that can make city living more affordable and hospitable. With spring weather just a few weeks away in Southern California, San Francisco–based Endemic Architecture has completed a courtyard installation for design brand Hem’s first U.S. showroom. Hem is known for partnering with rising designers for its collections of bespoke furniture and design accessories, a tradition the Stockholm, Sweden–based brand has extended to its new West Coast headquarters. Hem previously occupied a pop-up shop at the Row location of local retailer Poketo. The new showroom in Downtown Los Angeles is a collaboration with vintage wood floor manufacturer Madera designed to “celebrate [Hem’s] immersive and collaborative nature…through the layering of colorful graphic shapes,” according to a press release. Endemic’s design includes a site-specific installation that combines graphic patterning with bright colors that wraps the floor and walls of the courtyard. The installation, dubbed Confetti Courtyard by Endemic, is reminiscent of the office’s Confetti Urbanism installation that was installed last year at the California College of the Arts campus in San Francisco. Like in the previous design but at a much smaller scale, the courtyard is demarcated into zones by bright patterns and color blocks. 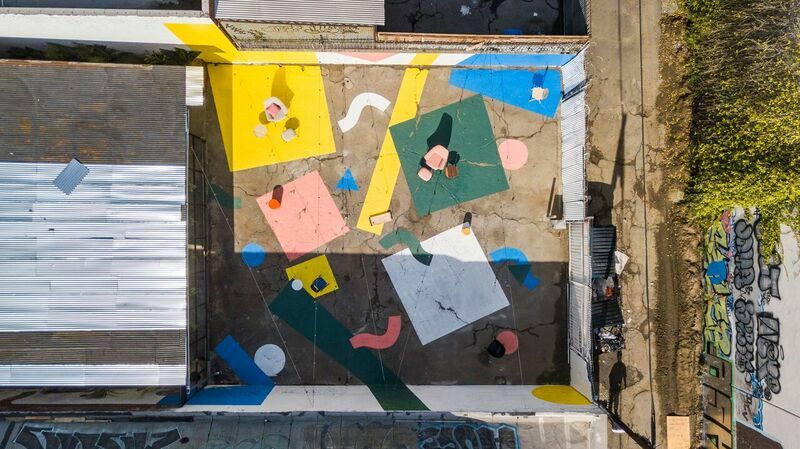 For the installation, yellow, green, white, and pink squares are arranged throughout the courtyard while peripheral bits of paint—shaped like squiggles, rectangles, and dots—float around the space and wrap the courtyard walls. The zones, according to the designers, are perfect for arranging sets of outdoor furniture and for creating different social zones when the courtyard plays host to parties and other social gatherings. The showroom is now open to the public. For more information, see the Hem website. 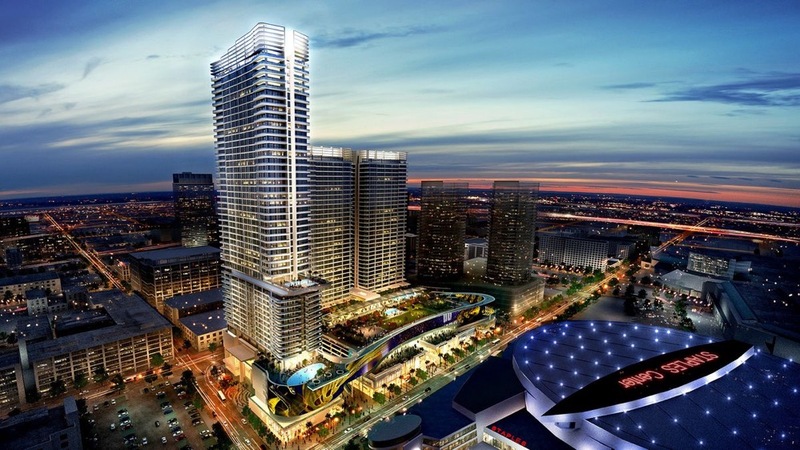 Construction on one of the largest projects under construction in Downtown Los Angeles, Oceanwide Plaza, has ground to a halt, according to The Los Angeles Times. The unexpected stoppage comes as the three-tower, CallisonRTKL-designed hotel, shopping, and residential complex was heading toward a mid-2019 completion date. According to The Times, the developer, a publicly-traded Chinese conglomerate known as Oceanwide Holdings, has indicated that financing troubles are behind the construction delay. According to a statement, Oceanwide is currently working to shore up the project’s finances and expects to start construction again in one month. More ominously, however, it’s believed that the project is somehow entangled in an ongoing political corruption probe that has scandalized the Los Angeles political establishment. According to The Times, federal investigators have inquired about the Oceanwide project in relation to possible crimes including bribery, extortion, money laundering, and kickbacks that could potentially involve City of Los Angeles officials and other development executives. No one has been formally arrested or charged in the investigation, however, and several other developments are also facing inquiries from federal authorities. The FBI raided the home and offices of Los Angeles city councilmember Jose Huizar in December as news of the probe surfaced. In the weeks since, the investigation has grown as another sitting city councilmember and several officials tied to Los Angeles mayor Eric Garcetti’s administration have come under scrutiny. Huizar, who oversees much of Downtown Los Angeles and was a voting member on the city’s powerful Planning and Land-Use Management (PLUM) committee, was stripped of key appointments in the fallout from the investigation. While he sat on the PLUM committee, Huizar made several controversial decisions that included a critical vote against granting Historic-Cultural Monument status to the William L. Pereira–designed portions of the Times Mirror Square complex, the historic home of The Los Angeles Times. At the time, Curbed reported, Huizar referred to the Late Modern structure as “an ordinary example” of Pereira’s work that did not merit recognition. Huizar is also behind Pershing Square Renew, an effort that would scrape away Pershing Square park in Downtown Los Angeles designed byRicardo Legoretta, Laurie Olin, and Barbara McCarren. With exterior work on Oceanwide Plaza nearly complete and interior work started on the project, it’s unclear that a short-term work stoppage will have much of an impact on the project’s final completion. A statement from the developer indicates that if construction resumes in February the project should wrap up sometime during 2020. We tend to think of cultural heritage in terms of iconic historical artifacts, and we tend to think of saving cultural heritage in terms of heroic acts to preserve historically important things. We tend to think of gentrification as an inevitable economic phenomenon that, like so many other components of our capitalist lives, produces winners and losers—benefitting some and injuring others. But the way we tend to think of both gentrification and cultural heritage is bound up in ideological forces that devalue the lived experiences of those most threatened by the onslaught of transformative economic change. 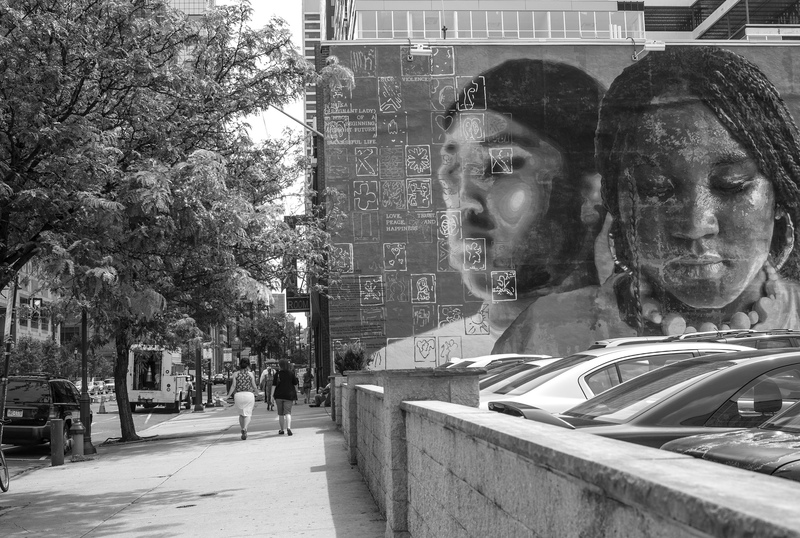 We are all familiar with how gentrification works. A historically working-class community sits adjacent to an upper-middle-class community where previous residents have been priced out. During the next real estate cycle, incremental pressure results in more upper-middle-class residents purchasing homes in the working-class area and eventually, the working-class residents get priced out and seek housing further outside of their community, resulting in longer commutes and a net loss in wealth. In a recent Washington Post article, “How record-setting art auctions are ruining the old neighborhood,” Philip Kennicott wrote: “Gentrification is about displacement, about the market coming in, taking things that felt like accessible common property and making them so uncommonly expensive that they are no longer what they once were…Something that was once habitual, a part of a beloved place—buying a cup of coffee or getting a haircut—becomes a locus of exclusion.” Kennicott’s premise is that gentrification takes affordable assets and makes them economically unattainable. But exclusion is about constraining options, not displacing options. If people can choose to purchase coffee either from a Starbucks or from an historic coffee shop next door, then diverse classes have an expanded set of options in the same proximate space. If we apply this example to residential units and other commercial sites, we could potentially develop communities without the blunt force of gentrification, i.e. without a simplistic acceptance that capitalism inevitably will produce ever-expanding zones of exclusion absent human intervention. Regardless, Kennicott and others err by focusing on exclusion at the expense of focusing on the processes of devaluation. Devaluation, in the context of urban gentrification, describes the processes by which systemic and institutional actions suppress the value of physical assets in underserved and low-income communities. Devaluation occurs through public policy—residential redlining, environmental racism and classism, deficits of public parks and civic amenities, etc. Revaluing is catalyzed when a devalued community is targeted for reinvestment. What are constantly undervalued are the untranslatable vestiges of the interior lives of displaced residents, the staged presence of culture within the homes and apartments that these residents once occupied. The architectural uncanny, according to Anthony Vidler, treats modernity as a catalyst for unleashing psychoanalytic forces deep in subjective will to produce simulated anxieties uniquely connected to the project of modernity—“feeling-effects” like alienation or estrangement, or the feeling of being a stranger in one’s own home. Revaluing these physical assets—seen as hollow shells or neutral sites for architectural reinvention and transformation by the wealth class— is heralded as the city remaking itself and becoming contemporary, as the supposedly inevitable transformation of physical structures no longer adhering to uses they have outgrown and responding to society’s new demands. For some communities and polities, the interiority of cultural experience is one of the few available modes of resistance. The exterior image of the typical single-family home is largely regulated by zoning codes and often bland aesthetic norms. Likewise, low-income apartment buildings and the like are already depicted as places of low cultural life and places where drug usage and violence coalesce. Therefore, any exterior treatment that further marginalizes the physical asset and the inhabitants further degrades and marginalizes the inhabitants’ existence. From the dramatic description of Harriet Jacobs’s garret as described in Incidents in the Life of a Slave Girl to the expressive imaging of Black American life in Kerry James Marshall’s Mastry series, the interior space of Black American life has been where culture is materialized. Undoubtedly, the interior space is still the place where the most marginalized populations find their unique counter-cultural voice expressed through the aesthetic construction of their spaces and lives. Working at the intersection of architecture, theory, and urbanism, USC Architecture is attempting to think anew about “pre-gentrification zones”—places that, because of land ownership and the scale of under-development in comparison to adjacent real estate markets, are ripe for large-scale rethinking in advance of unregulated market-driven development that would force out current residents, landowners, and renters. Working with municipalities, community groups, and designers, we will utilize design as a form of policy to influence future development in these and other areas. In Los Angeles, Fresno, and the San Diego/U.S.-Mexico border region, we will examine and analyze the conditions and presuppositions that support the processes of devaluation and revaluation, as well as speculate as to how interventions can be made by market and non-market actors in achieving more egalitarian results to urban redevelopment imaginings. Cultural heritage is no longer separate from urban redevelopment, just as gentrification is no longer an issue that exclusively affects the poor. As we are witnessing, a lack of affordable housing creates ripple effects in all housing markets and sub-markets and thus affects the pricing of both rental and owner-occupied housing across virtually all sectors of the market. We must use design, architecture, and aesthetics as primary drivers of new policy interventions that will result in the development of cities in which all are able to afford the civic and public infrastructure that we all pay for. Milton S. F. Curry is Dean and Professor at the USC School of Architecture and holds the Della & Harry MacDonald Dean’s Chair in Architecture. Dean Curry obtained his Master in Architecture post-professional degree from Harvard Graduate School of Design and his Bachelor of Architecture from Cornell University. He was associate dean for academic affairs and strategic initiatives at the University of Michigan Taubman College of Architecture & Planning from 2010 to 2017. Dean Curry has held teaching positions at Harvard University, Arizona State University, and Cornell University. Throughout his career in academia, he has coordinated graduate and undergraduate design studios at all levels and has taught theory-related seminars on architecture and cultural theory, urbanism, and housing. He is recognized as a leading voice in integrating cultural theory, race, and class into the ongoing interrogation of modernism and modernity. He has founded two academic journals: Appendx in 1993 and CriticalProductive in 2008. A plan to bring congestion pricing to Los Angeles County has taken a tentative step forward, The Los Angeles Times reports. In an effort to reduce traffic while also raising funds for new mass transit projects, next month the board of directors for the Los Angeles County Metropolitan Transportation Authority (Metro) will take up an initiative to study the issue. The initiative, if approved, would allow the board to assemble a panel of experts to investigate how congestion pricing might work in Los Angeles County, where The Los Angeles Times reports nearly three-fourths of commuters drive to work. According to Metro, it could take up to two years to study possible congestion pricing plans. Metro’s consideration of congestion pricing comes as the transit authority gears up for its “28 by 28” initiative, a plan that seeks to bring over two dozen transformative transportation projects to fruition before the city hosts the 2028 Olympics. The 28 by 28 plan would build-out L.A.’s planned public transportation system as envisioned by the recent Measure M initiative. The 2016 measure raised county sales tax rates to partially fund system expansions to the tune of $860 million per year. That’s a sizable chunk of what’s needed to bring many projects to life, but ultimately not enough to have them completed before 2028, hence the need for additional funding. Metro is expected to tap federal and state funding sources—including California’s gas tax funds—to fill in funding gaps for projects that include a new transit route crossing the Sepulveda Pass, the completion of the Purple Line to Westwood, and a new transit line connecting Downtown Los Angeles with the southeastern suburb Artesia. 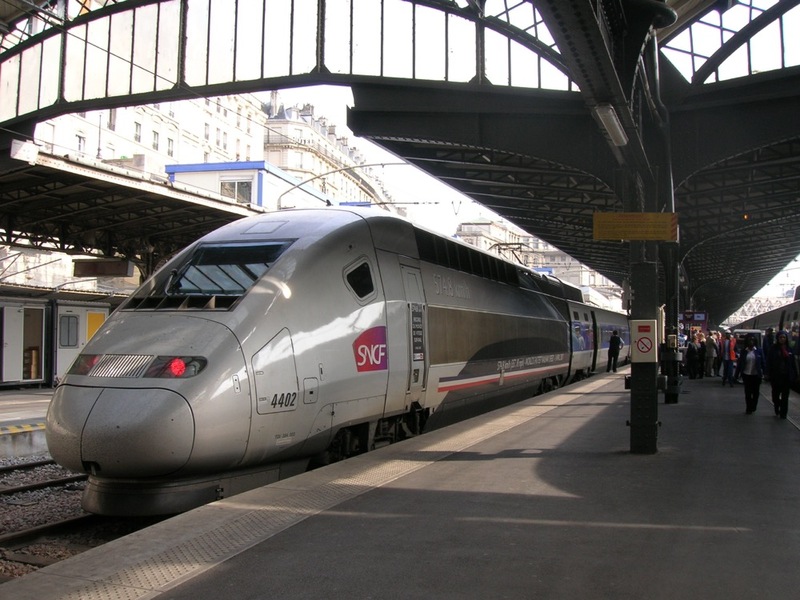 Congestion pricing could help bridge the gap for the agency, however. 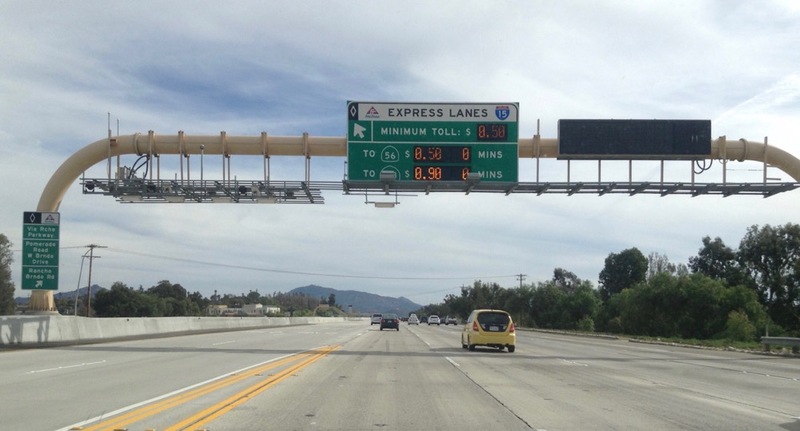 According to The Los Angeles Times, a recent Metro report indicates that a per-mile tax on driving could raise $102 billion over ten years and that a fee to enter Downtown Los Angeles could bring in an additional $12 billion. Metro officials claim that congestion pricing could bring in enough new funding to lower base transit fares or even make the entire system free to ride. It’s possible that with the right congestion pricing plan, Metro could make transit more affordable and useful as it makes driving more expensive and difficult in tandem. Starting February 9, the MAK Center for Architecture in Los Angeles will exhibit Shelter or Playground: The House of Dust at the Schindler House, a fresh look at the intersection of contemporary architecture, technology, and performance art. The exhibition is curated by Maud Jacquin, Anna Milone, and Sébastien Pluot of Art by Translation (TALM) and is organized with the help of the MAK Center for Art and Architecture at the Schindler House, France Los Angeles Exchange (FLAX), and the California Institute of the Arts (CalArts). For the group exhibition, the curators have organized a set of performances, commissions, and installations that draw inspiration from The House of Dust, a “seminal yet under-recognized” late 1960s work by Fluxus artist Alison Knowles, according to a press release. The House of Dust is considered among the first computer-generated works of poetry and is composed of repeating quatrains each beginning with the phrase “A House of . . . ” that is then followed by a random sequence of computer-generated materials, sites or locations, light sources, and categories of inhabitants. In 1968, Knowles translated the poem into a physical structure at a site in Chelsea, New York. 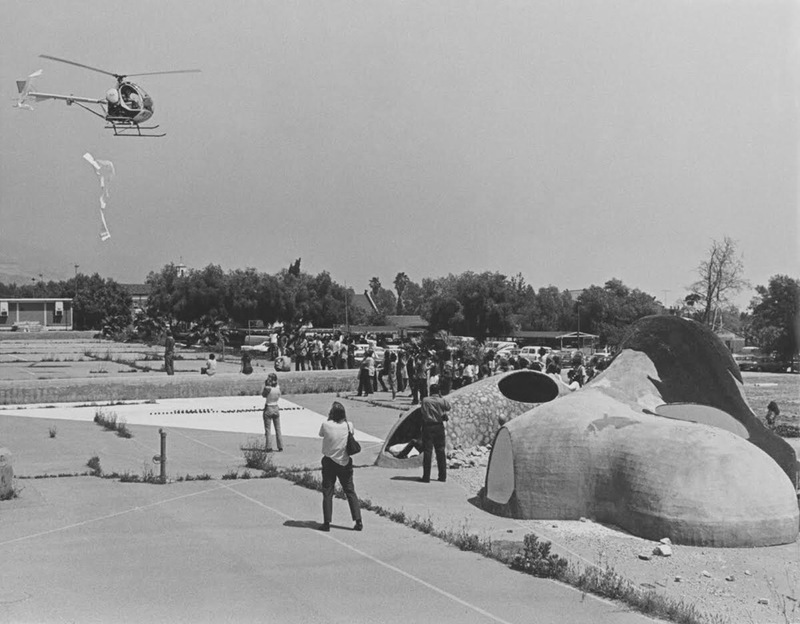 The structure was eventually destroyed and then rebuilt and moved to the CalArts campus, where Knowles taught in the early 1970s. At CalArts the structure served as a makeshift classroom, an exhibition space, and as a catalyst for student work. The coming presentation at the MAK Center seeks to pick up the work’s generative potential with new installations and performances by Henry Andersen & Bryana Fritz/Slow Reading Club, architectural writer and researcher Lila Athanasiadou, media artist Jasmin Blasco, French architects François Dallegret and François Perrin, and FLAX Artist-in-Residence Aurélie Godard, among many others. For a full list of participants, see the MAK Center website. The run of the exhibition will include a program of historical performances highlighting works by Merce Cunningham and Trisha Brown. CalArts students will also perform interpretations of scores created by Fluxus-associated artists, including Alison Knowles, Yoko Ono, Alvin Lucier, and Pauline Oliveros. Los Angeles–area arts spaces are having a rough go of it lately. Just this week, two long-standing art and architecture galleries announced either immediate or planned closures. 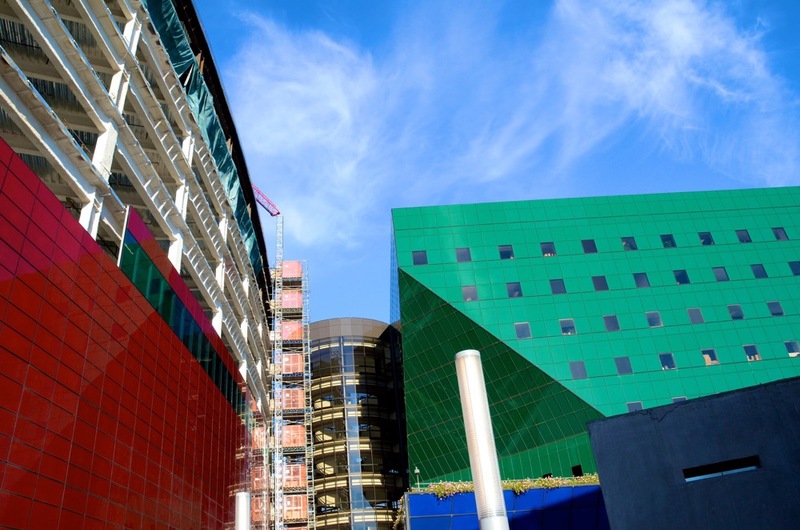 The Downtown Los Angeles–based Museum of Contemporary Art announced Wednesday that it would be shutting down its architecture and design galleries at the Cesar Pelli–designed Pacific Design Center (PDC) in West Hollywood. Though MOCA has occupied the space for over 20 years, MOCA board chairperson Maria Seferian gave few details in a press release announcing the move, saying simply that “the programming agreement between the two organizations has reached the end of its term.” Seferian added, “We are grateful for our partnership with the PDC ... and now look forward to consolidating and growing our exhibition activities, including presentations on architecture and design, at MOCA’s two Downtown Los Angeles locations.” The museum maintains its flagship, Arata Isozaki–designed location in Downtown Los Angeles’s Bunker Hill district and a Frank Gehry–designed outpost in Little Tokyo. MOCA recently came under the direction of Klaus Biesenbach, the former director of MOMA PS1 in New York City. Over the years, MOCA has exhibited the work of many artists and designers at the PDC, including Takashi Murakami, Catherine Opie, Rodarte, Jean Prouve, and Rick Owens, among others. The current exhibition on view, One Day at a Time: Kahlil Joseph’s Fly Paper, will close out the space on February 24. The news came just one day after Los Angeles Downtown News reported that the local artist–friendly Main Museum had abruptly closed down. According to the report, the museum’s top staff, including museum director Allison Agsten, left their posts in late 2018. The museum is temporarily located in a storefront in L.A.’s Old Bank District as plans for an artful expansion by Tom Wiscombe Architecture (TWA) were supposedly underway. A reason for the museum’s closure has not been stated. The Pasadena Museum of California Art (PMCA) also closed its doors last year following financial troubles and a long and expensive list of necessary building repairs. PMCA opened in 2002 as a non-collecting museum focused exclusively on California art and design from the 1800s to the present. The closures run somewhat counter to the actions of other local arts organizations like the Los Angeles County Museum of Art (LACMA) and the Art and Los Angeles Philharmonic. In advance of a planned closure of its main William Pereira and Pfeiffer Associates–designed flagship, the museum announced its intention to open several satellite locations across the city, including a pair of art spaces in South Los Angeles. The L.A. Philharmonic, on the other hand, is pushing forward with its own expansion to Inglewood, where Gehry Partners is designing a new headquarters for an associated youth orchestra. Google will be moving to the building currently known as the Westside Pavilion shopping mall in West Los Angeles. 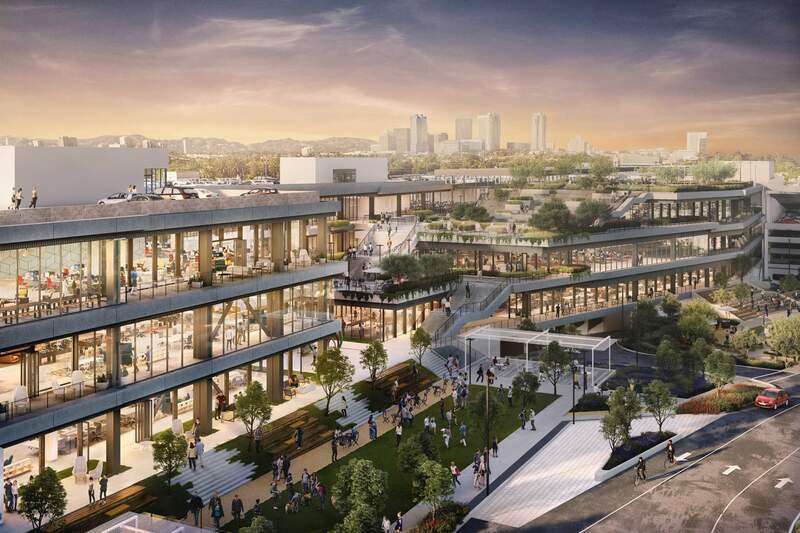 Last week Hudson Pacific Properties and Santa Monica, California–based real estate investment company Macerich announced that the tech company would move into One Westside, as the property is known, after a substantial renovation. Gensler was tapped to convert the mall into 584,000 square foot of state-of-the-art office space, and the redesigned structure will include terraces, flexible interior layouts, and folding glass walls to connect the inside to out. This is not Google's first site in the Los Angeles area. The company recently moved into a large timber warehouse in Playa Vista and maintains branches in Venice and Irvine. Gensler has plenty of experience in this arena, having done numerous office spaces for tech companies, including a home for NVIDIA in Santa Clara, California, that won a 2018 Best of Design Award. One Westside has a prime location thanks to Los Angeles's ever-expanding public transit network, with the Expo Line light rail’s Westwood/Rancho Park station a five-minute walk away. The renovation is scheduled to be finished in 2022 when Google will begin a 14-year lease. We never got a chance to ask him why his latest American project—the Audrey Irmas Pavilion for Wilshire Boulevard Temple in Los Angeles—looks like a project lifted from BIG. No question, Rem is a genius. Nonetheless, his wake is toxic: stained by Randian egos (both triumphal and crushed), the intense interpersonal competition, and the exploitation of intellectual and manual labor. How does it all end, you wonder. 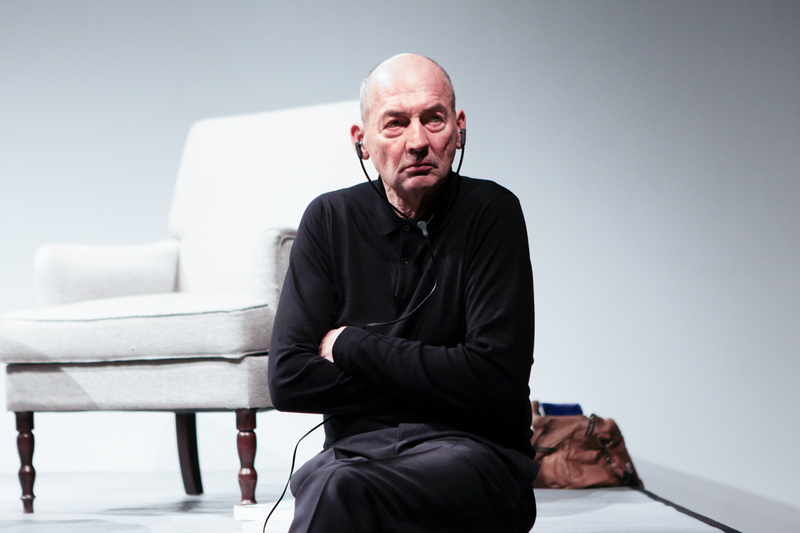 In some ways, Tomas Koolhaas’s documentary was a preemptive eulogy. Death is present in every shot, tugging at the great man’s sleeve. The film is also suffused by an intense melancholy. It is the peculiar sadness of endings: when a family line is extinguished, when change erases beauty and meaning, when an entire world order disintegrates. Starchitects are still with us, even though their era is over. Koolhaas himself called time on it in the mid-aughts. It is no contradiction to honor them, while admitting that we must give ourselves permission to abandon the figure of the heroic architect, and along with it the Western blueprint for greatness. 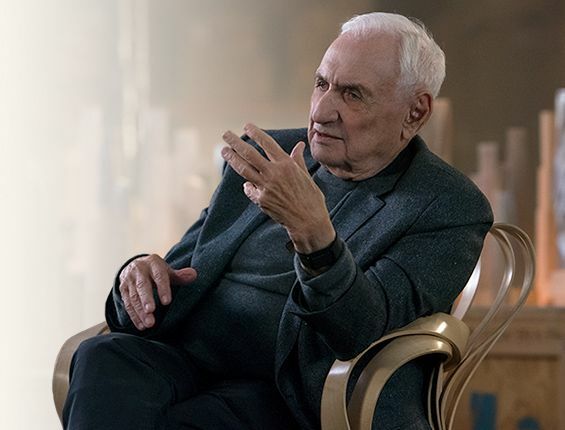 According to court documents obtained by The Blast, a judge has granted Frank Gehry a restraining order after he was reportedly menaced by a potential job seeker. Throughout 2018, a Midwestern man in his 20s (The Blast declined to name the accused) repeatedly visited the Los Angeles office of Gehry Partners to ask about a job. Although Gehry himself never met the man, testimony lodged by his employees noted that he “consistently appeared ‘disheveled’ and displayed erratic behavior.” Unsatisfied with the response he was getting at the office, the man then began sending the 89-year-old Gehry increasingly violent death threats over email, many of which were collected and presented as evidence by Gehry’s lawyer. Even worse, Gehry believed that the man had stopped taking his medication and was going to attempt to force a face-to-face confrontation in L.A. On January 11, a judge granted Gehry’s request for protection and ordered that the man stay at least 100 yards away from Gehry and his wife Berta for the next five years. It takes two to tango. At least, that’s the case for Seattle-based Mithun and Culver City–based Hodgetts + Fung (HplusF), two west coast architecture firms that have announced a new, mutually-beneficial merger aimed at boosting one another’s clout in key project sectors. Mithun, a national architecture, landscape architecture, urban planning, and interior design practice with satellite offices in San Francisco and Los Angeles will bring a bevy of large-scale housing, institutional, commercial, and urban mixed-use projects to the merger. Mithun, originally founded in 1949, has been awarded six AIA Committee on the Environment (COTE) Top Ten awards and the 2017 AIA Pacific Northwest Region Firm award, among other accolades. The firm has its hand in many projects, including a pair of student housing projects at the University of California, Los Angeles, totaling 3,200 beds and a new mixed-use complex at University of California, Irvine, among others. Hodgetts + Fung, a small design firm helmed by architects Craig Hodgetts and Hsinming Fung, is well-known for its signature and artful cultural commissions, including a recently-completed renovation and expansion to the historic Frost Auditorium in Culver City, the Menlo-Atherton Center for Performing Arts in Silicon Valley, the Nashville West Riverfront Park Amphitheater, Towell Library at UCLA, and the Chapel of the North American Martyrs on the Jesuit High School Campus campus in Carmichael, California. Over the years, HplusF has been awarded over 40 design awards, including the AIA California Council Firm Award in 2008. With the merger, the firms will share a name in Los Angeles—Mithun | Hodgetts + Fung—for now, but that could change in a few years as the new entity becomes more established. The union will give HplusF the “right muscle” to go after more employee-heavy housing-focused projects, Hodgetts explained, an interest the firm has always wanted to explore but has so far been unable to fully undertake until now. With local and state governments, especially in California, stepping up their efforts to rein in housing costs through new construction, housing of all types is set undergo drastic expansion on the West Coast in coming years. In exchange, Mithun will gain access to diverse culturally-driven clients, a realm the growing, design-focused firm has been hungry to enter itself.